The first bridge to be built across Venice’s Grand Canal in almost 75 years will be opened to the public on September 18 in a formal ceremony. Designed by architect and engineer Santiago Calatrava, the bridge will take its place up-stream from the famed Rialto Bridge, the first bridge to span the Grand Canal at the end of the 16th Century, and the Scalzi and Accademia Bridges which date from the early 1930s. Calatrava’s bridge, which was commissioned by the Municipality of Venice through a public selection process in November 1999, is sited at an extremely strategic point, connecting the railway station (Stazione Santa Lucia) on the north side of the Grand Canal with the Piazzale Roma on the south. The Grand Canal bridge will be important both functionally and symbolically, not only will it connect rail travelers more directly to the city, but it will also welcome visitors to Venice with a panoramic view of the Grand Canal. Care has been taken to integrate the Grand Canal bridge with the quays on either side. The steps and ramps are designed to add vitality to both sides of the canal, while the crescent-shaped abutments leave pedestrians with free access to the quays. The areas at either end act as extensions of the Grand Canal span, creating new celebratory spaces for Venice. On the south side, the design also provides a new passage between the Piazzale Roma and the mooring platforms for the ACTV water transport. The bridge is 101.16 meters (331.89 ft) long, with a central span of 81 meters (266 ft). The width varies from 5.39 meters (17.68 ft) at either landing to 9.38 meters (30 ft) at the midpoint. The Grand Canal bridge rises from a height of 3.45 meters (11.32 ft) at the landing to 9.28 meters (30 ft) at midpoint. The all-steel structural element consists of a central arch of very large radius (180 m, or 590 ft), with two side arches and two lower arches. Joining the arches are girders made of steel tubes and plates, which form closed section boxes and are placed radial to the main radius. 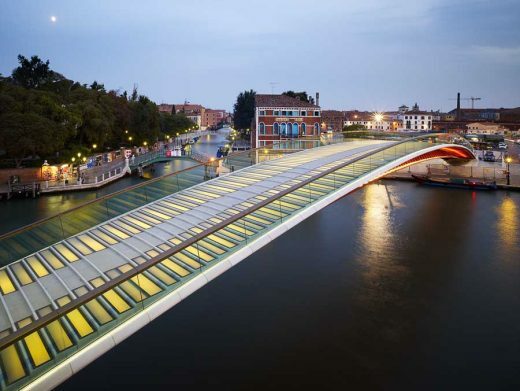 The steps and deck of the Grand Canal bridge are made of alternating sections of tempered security glass and natural Istria stone, picking up the design of the existing pavement in many bridges in Venice. (The abutments, made of reinforced concrete, are clad in the same stone.) The parapet is entirely glass, with a glazed bronze handrail comprising its upper edge. At night, fluorescent bulbs set within the handrail illuminate the path, adding to the stage-set effect created by illumination from below the transparent deck. Spotlights set low on the walls illuminate the ground on either end of the bridge. No other city in the world has so many large and small bridges as does Venice. The addition of one more should not cause much of an impression-except that the construction of a new pedestrian bridge over the Grand Canal, only the fourth been built since the 16th century, is clearly a national and international event. The Grand Canal is of immense importance to Venice, both historically and as a contemporary thoroughfare. It was first spanned by the Rialto Bridge, built in 1588-91. The Accademia Bridge was added in 1932 (and rebuilt in 1984), and the Scalzi Bridge was constructed in 1934. In June 1999, the Municipality of Venice drafted a preliminary plan for a fourth Grand Canal bridge. Through a public selection process, Santiago Calatrava won the commission in November 1999. The Grand Canal span design was approved in February 2001 and the project approved and budgeted in April 2002. The Grand Canal span project is sited at a strategic point, connecting the railway station (at the north end of the bridge) with the Piazzale Roma (the City’s arrival point by car or bus) on the south. The bridge will therefore be important both functionally and symbolically, giving visitors their first impressions of Venice and providing a panoramic view of the Grand Canal. Care has been taken to integrate the bridge with the quays on either side. The steps and ramps are designed to add vitality to both sides of the Grand Canal, while the abutments (which are crescent-shaped) leave pedestrians with free access to the quays. The areas at either end act as extensions of the bridge, creating new celebratory spaces for Venice. On the south side of the Grand Canal, the design also provides a new passage between the Piazzale Roma and the mooring platforms for the ACTV water transport. The bridge is 331.89 ft long, with a central span of 266 ft. The width varies, from 17.68 ft. at either foot to 30 ft. at the midpoint. The Grand Canal bridge rises from a height of 11.32 ft. at the foot to 30 ft. at midpoint. The all-steel structural element consists of a central arch of very large radius (590 ft.), with two side arches and two lower arches. Joining the arches are girders made of steel tubes and plates. 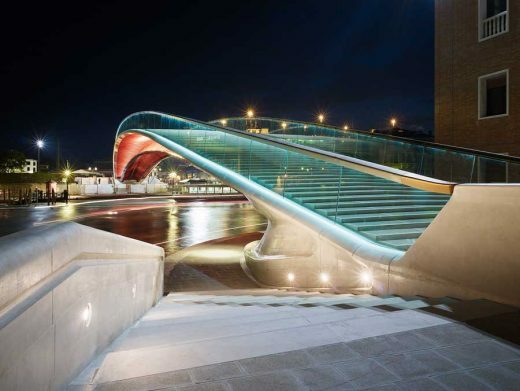 The steps and deck of the Grand Canal bridge are made of alternating sections of tempered security glass and natural Istria stone, picking up the design of the pavement on many of the existing bridges in Venice. (The abutments, made of reinforced concrete, are clad in the same stone.) The parapet is entirely glass, with a bronze handrail comprising its upper edge. At night, fluorescent bulbs set within the handrail will illuminate the path, adding to the stage-set effect created by illumination from below the transparent deck. Spotlights set low on the walls will illuminate the ground on either end of the bridge.? Architect and Engineer Santiago Calatrava was assigned by the Comune di Venezia with the preparation of the architectural and structural engineering design documentation of the IV Bridge over the Grand Canal on 1999. The Project, developed by Santiago Calatrava on the basis of all applicable norms and laws, and in collaboration with many state and city entities, such as the State Railway (Ferrovie dello Estato), Venetian Transport Services (ACTV), Association of People with Disabilities, Fire Brigade (VVFF), Police, etc., went through a series of reviews and scrutiny by many different agencies such as the Agency for the Protection of the City of Venice (Salvaguardia di Venezia), the Administration for Cultural and Artistic Goods of Venice (Sopraintendenza ai Bieni Artistici e Culturali di Venezia), and other Agencies. In particular, the Grand Canal span project was scrutinized and evaluated by an independent Agency, the ICMQ, which has validated and approved the design as sound and in conformity with all applicable laws and regulations. The submitted Final Design (Progetto Essecutivo) was then approved by the Comune di Venezia. Upon that, the Comune di Venezia prepared all procedures for the tender of the project, establishing all qualifications and requirements for the construction companies to participate in the tender. Of almost 90 applications, the works were assigned to the Cignoni enterprise, which was selected on the basis of the lowest bid for the construction of the project, providing a lower bid than the Cost Estimate established during the project. The company Lorenzon from Noventa di Piave was steel subcontractor. The selection of the construction company was completely under the control and care of the Comune di Venezia, following all due procedures for the specification of the bids, the selectivity of the companies, the selection process and contract assignment process. The construction of the project started in 2003. The Administration of the Comune di Venezia created an internal group lead by Engineer Roberto Scibilia for the Site Direction and Supervision of Construction (Direzzione dei Lavori), having the full responsibility over the progress of the Works, the financial and time constraints, and had full control of all contractual agreements and implications. During construction, Santiago Calatrava was assigned to provide consultancy services regarding architectural and artistic advice in relation to the works, reviewing shop drawings prepared by the contractor, and providing site visits in order to maintain architectural, structural and artistic consistency of the works in relation to the proposals and methods of the construction company. Although the original design had addressed the accessibility of the Bridge for people with diverse disabilities, by providing mechanical elements that would allow the access to the center of the bridge and the descent to the other side, the Comune di Venezia, after a petition of the local associations, requested that the accessibility elements be changed into a different system. This system was welcome and approved by Calatrava and the necessary reinforcements of the structure were implemented, so that this new system can be implemented as decided by the Comune di Venezia. During the construction period, the construction company and other participating entities, and in particular the steel fabricator, requested many modifications in the methods of fabrication, proposing modifications and improvements to the design. It was always the responsibility of the Site Administration team of the Comune di Venezia to finally decide, which, in what manner, and under what financial and time implications these proposals were to be implemented. The office of Calatrava assisted the site administration by technically evaluating these proposals. During completion of the works, the Bridge has been scrutinized and tested through most sophisticated methods of testing, establishing that the behavior of the structure is totally fulfilling the most demanding requirements and even responding better than expected.